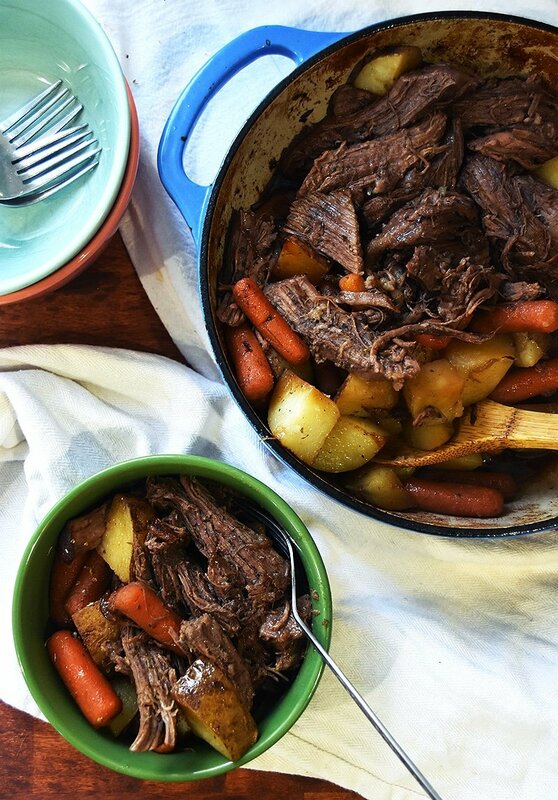 Grandma's Sunday Oven Pot Roast | srsly pot roast in the oven is best! This pot roast recipe is similar to ones used across the country for Sunday Suppers. 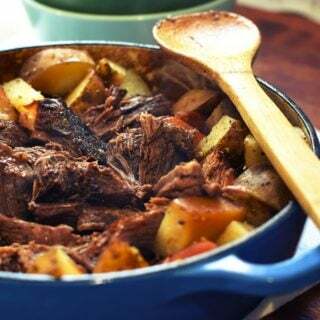 Oven Pot roast was a classic family Sunday dinner that Grandma would get started before heading to church and finish when everyone got home. 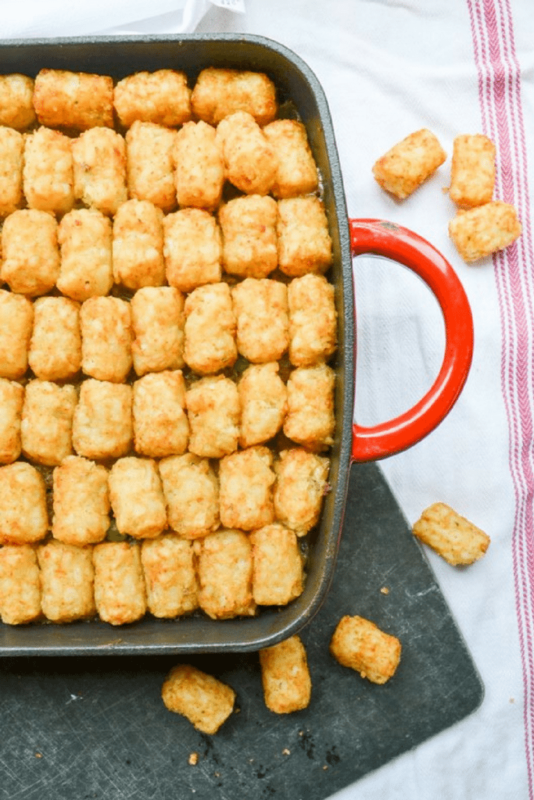 Before the era of the crock pot, the oven did all the work. And I think making Grandma’s pot roast in an oven can’t be improved upon. It is simply the best. Let me walk you through making the best pot roast. It is a simple and easy process that just takes a bit of loving time in the oven. Most of that time is simply waiting for the oven to do the work. Watch a movie, check your phone, do some laundry, or play with the kids while the roast is cooking. There are several cuts of beef that work fine for a pot roast, I’m using an arm roast for this recipe. Whatever cut of beef you choose, you’ll want one about 3 pounds, for this recipe. The beautiful thing about roasting a pot roast in the oven for hours is that it allows us to use a cheaper cut of meat. The roasting makes it SOOO good and rich. A budget-friendly recipe. Alcohol breaks down meat and tenderizes it. 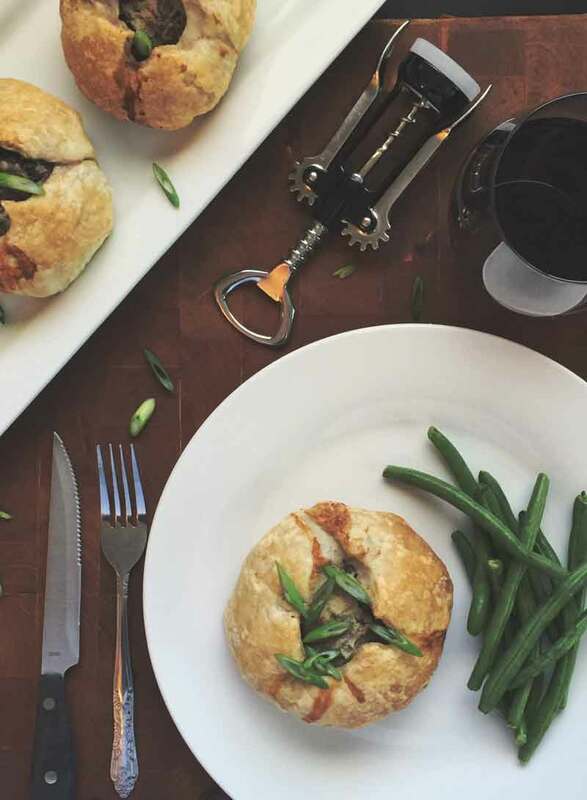 It gives you an excuse to drink some wine while you cook. The flavor from using wine is full-bodied and amazing! Traditional veggies for a red wine pot roast are potatoes, celery, carrots, and onion but add some of your family’s faves. Rutabagas, mushrooms, parsnips, and squash are great additions. If you do add additional veggies than what is in the recipe, increase your liquid to give the veggies liquid to draw from and use to cook. 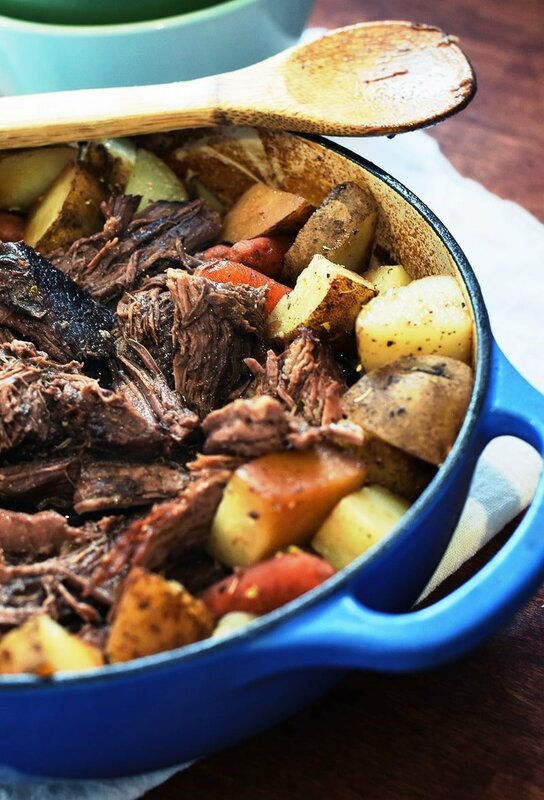 Do you know why so many people that make pot roast end up with soggy veggies but tender beef? They add the veggies at the same time as the beef. Don’t do that. Cook the beef roast for about 1 1/2 hours and then add the veggies. You’ll have perfectly tender veggies that aren’t mushy and gross. Do you cover a beef roast in the oven? There are a couple thoughts on this. And it depends. For this..yes! 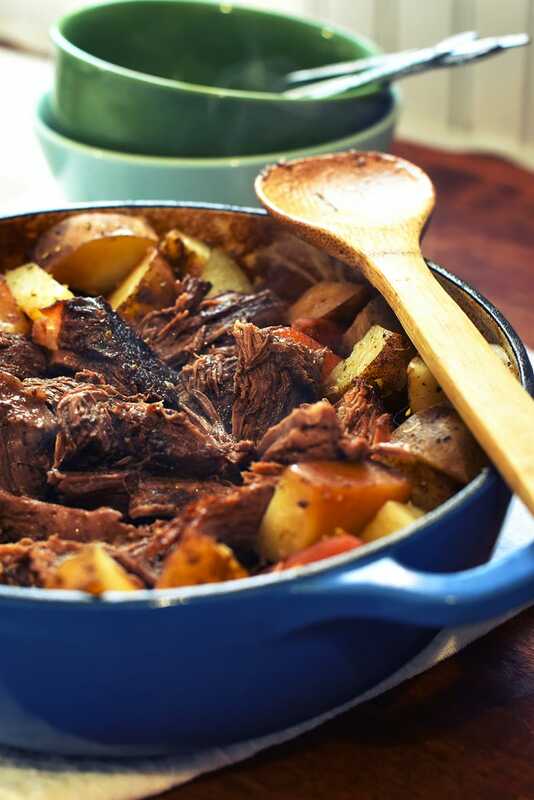 Most old-fashioned pot roasts made up in the oven are an old-fashioned version of a slow-cooker and rely on the steam and liquid to help cook everything. However! I have made roast without covering it and basting it often and it is yummy yummy! Roast beef is a good example of this technique. How long do you cook a beef roast in the oven? Plan on 1 hour per pound. So, a 3 pound is about 3 hours. A 5 pound would be about 5.5-6 hours. You can make a delicious pot roast that your whole family will rave about. Really, you can!! 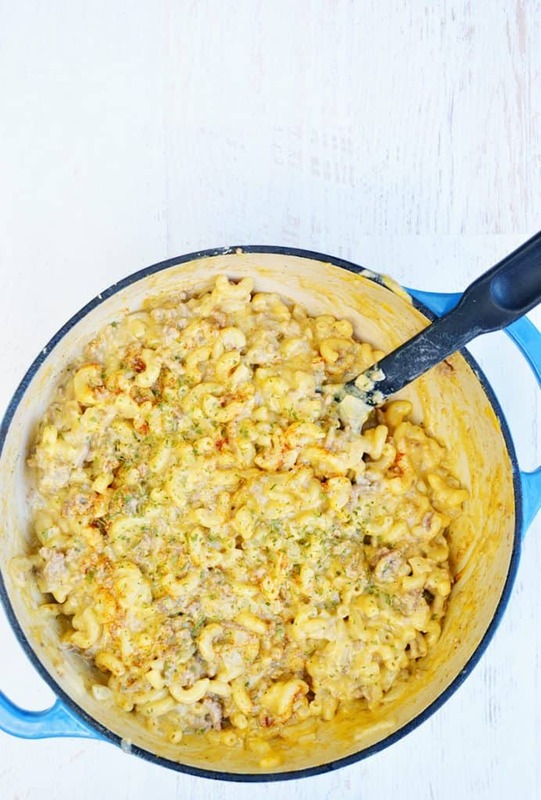 And it is sooo much easier than you think to make this classic comfort food! Add in the veggies your family prefers. 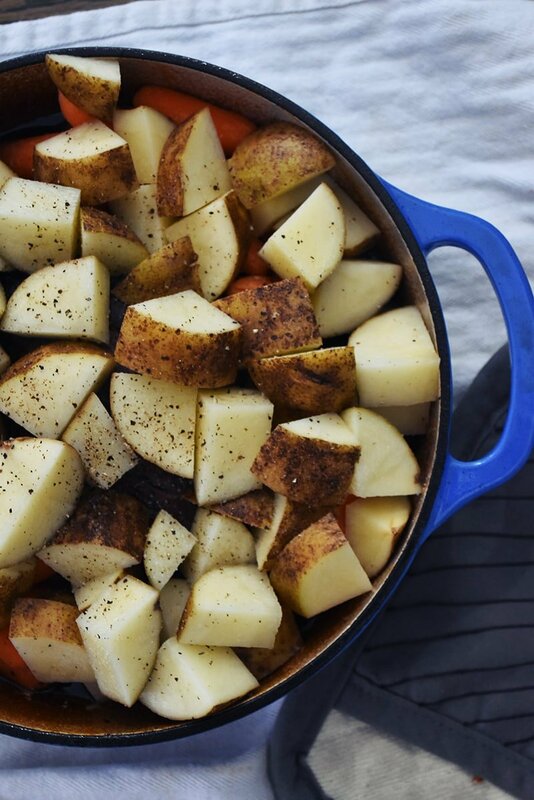 Although it doesn’t get much more classic than potatoes, carrots, and onions. Rutabagas work well, turnips are a favorite, and sweet potatoes are a great alternative to the traditional potato. 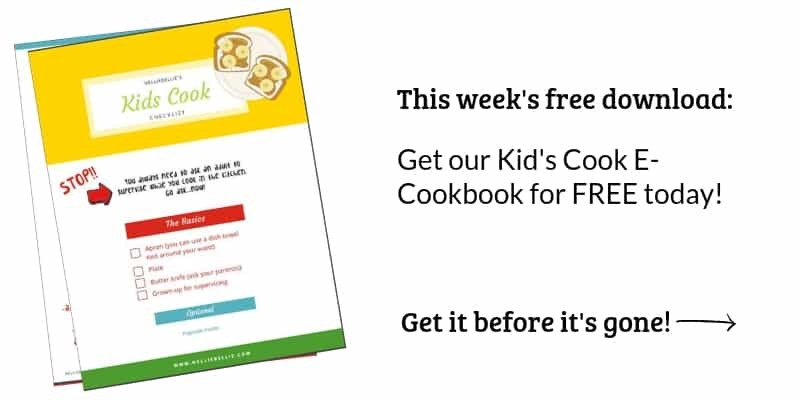 IF you happen to have leftovers, they can be stored in the fridge for a couple of days and are delicious in a breakfast hash, sandwich, or even a soup. IF you have leftovers :). It rarely seems to happen for me regardless of how well I plan. Preheat the oven to 325. Heat the oil in the pot on medium-high heat. Sprinkle seasoning salt on roast. Add roast to pan, cook 5 minutes. Turn to brown each side. Remove the roast from pan and add onions and garlic. Saute until garlic is fragrant and browned. Add the red wine to the pot. Cover pan and bake for 1.5 hours. Remove pan from oven and add veggies. Cover and bake for another 1-1.5 hours or until vegetables are tender and meat is cooked. 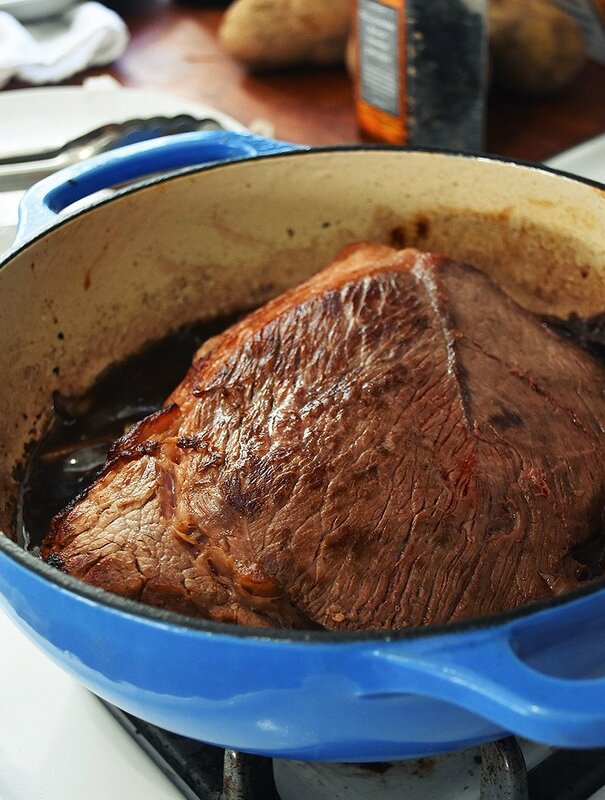 are you a fan of Worcestershire sauce in your roasts? Go ahead and add a couple tablespoons! You do not include times or tempratures at all in your recipe for Grandmas Sunday Pot Roast. What would they be? Such as oven temprature. You also did not include the “steps” such as when to add ingredients . Oh no oh no oh no!! Those are major issues. We will get that fixed, soon. Thanks for letting me know!